See the chicken on the left? If you can't tell, it has an orange color to it. The one on the right doesn't. I had to special order the one on the right and request it WITHOUT food coloring. I'm glad I asked because if not, I would've been feeding my family something I am strictly against in all of our diets. While we donest very clean, we also enjoy burgers, fries, pizza and other foods on occasion. What I do NOT however have nor allow my kids to have artificial food dyes. After severe behavioral issues with my daughter, tantrums, teachers saying she may have ADHD I started researching and quickly learned about the effects of artificial food dyes. When we eliminated the dyes, her behavior COMPLETELY changed and she no longer has tantrums, outbursts or problems in class. 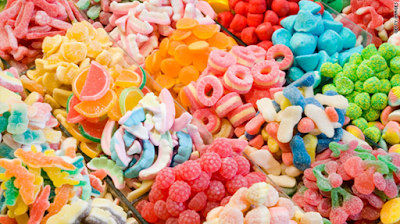 Every year, food manufacturers pour 15 million pounds of artificial food dyes into U.S. foods. Some of the most commonly used food dyes may be linked to numerous forms of cancer, along with hyperactivity and other behavioral problems in children. While Europe has recently placed regulations on labeling food dyes to inform consumers of the health risks, the United States has no such requirement. Every year, food manufacturers pour 15 million pounds of artificial food dyes into U.S. foods -- and that amount only factors in eight different varieties, according to the Center for Science in the Public Interest (CSPI). These dyes are so common in U.S. foods -- especially kids' foods -- that parents don't think twice about giving their children rainbow-colored cereal or fluorescent blue "juice," and adults don't consider bright orange cheese puffs out of the ordinary, either. But you might do a double take if these food packages contained warnings detailing what these artificial food colorings may really be doing to your health, and that of your children. In Europe at least, they do. As of July 2010, most foods in the EU that contain artificial food dyes were labeled with warning labels1 stating the food "may have an adverse effect on activity and attention in children." The British government also asked that food manufacturers remove most artificial colors from foods back in 2009. In the United States, however, consumers are still snatching up artificially colored foods with fervor, as most are completely unaware of the risks involved … and let me just say, hyperactivity in children is only the tip of the iceberg. "The three most widely used dyes, Red 40, Yellow 5, and Yellow 6, are contaminated with known carcinogens … Another dye, Red 3, has been acknowledged for years by the Food and Drug Administration to be a carcinogen, yet is still in the food supply." In their 58-page report, "Food Dyes: A Rainbow of Risks," CSPI revealed that nine of the food dyes currently approved for use in the United States are linked to health issues ranging from cancer and hyperactivity to allergy-like reactions -- and these results were from studies conducted by the chemical industry itself. For instance, Red # 40, which is the most widely used dye, may accelerate the appearance of immune system tumors in mice, while also triggering hyperactivity in children. In addition to considerations of organ damage, cancer, birth defects, and allergic reactions, mixtures of dyes (and Yellow 5 tested alone) cause hyperactivity and other behavioral problems in some children. Because of those toxicological considerations, including carcinogenicity, hypersensitivity reactions, and behavioral effects, food dyes cannot be considered safe. The FDA should ban food dyes, which serve no purpose other than a cosmetic effect, though quirks in the law make it difficult to do so (the law should be amended to make it no more difficult to ban food colorings than other food additives). In the meantime, companies voluntarily should replace dyes with safer, natural colorings." If you need further incentive to ditch artificially colored foods from your diet, remember the reason they're added to processed foods in the first place: to make a food that would otherwise be an off-colored mess look appealing. When foods are processed not only are valuable nutrients lost and fibers removed, but the texture, natural variation and flavors are lost also. After processing, what's actually left behind is a bland, uninteresting "pseudo-food" that most people would find entirely unappetizing. So at this point, food manufacturers must add back in the nutrients, flavor, color and texture in order to make them desirable, and this is why they become loaded with food additives. In the case of kids' foods, bright colors are also added to attract kids' attention and make the foods appear "fun." But in most cases, if a food comes in an outrageous color that is not found in nature, consuming it is not a good idea. Take one carefully designed, randomized, double-blind, placebo-controlled study published in the journal The Lancet5. It concluded that a variety of common food dyes, and the preservative sodium benzoate -- found in many soft drinks, fruit juices and salad dressings -- do in fact cause some children to become measurably more hyperactive and distractible. The results of this study were what prompted the British Food Standards Agency (FSA) to issue an immediate advisory to parents, warning them to limit their children's intake of additives if they notice an effect on behavior. As mentioned earlier, they also advised the food industry to voluntarily remove the six food dyes named in the study back in 2009, and replace them with natural alternatives if possible. The United States, however, has not followed suit in issuing any similar warnings to American parents, even now two years later. Let me make it clear that your diet should include a range of vibrantly colored foods … but these foods should be the ones that are naturally rich in color. Red bell peppers, purple eggplant, green spinach, blueberries and rainbow chard are all examples of healthy foods whose bright colors are signs of the important nutrients they contain. These are the food colors you need in your diet … not the man-made varieties found in most processed foods. The good news is avoiding artificial food dyes is incredibly easy -- just stick to whole fresh foods and avoid the processed ones. If you need help breaking an addiction to processed foods, these seven steps will help you wean off of them in favor of healthier, unprocessed, natural alternatives.